My lunch today at de Ysbreeker inspired me to create a new recipe based on the principle of red power, a Red Power Salad with red quinoa, red cabbage, red beets, pomegranate seeds and cranberries. The Red Winter Salad I had today at de Ysbreeker came with red cabbage, pomegranate seeds and lentils. It reminded me of a post I did a while back on a recipe for Red Power Juice. I talked about red power being the new green power. When it comes to health, the colours on your plate matter. Phytonutrients, also known as phytochemicals, are the nutrients often concentrated in the skins of fruits and vegetables, that are responsible for their color. Phytonutrients are powerful antioxidants that are important for optimal health. Antioxidants help prevent free radical damage. The best thing you can do for your health is to bring as much diversity and color to your plate as possible. 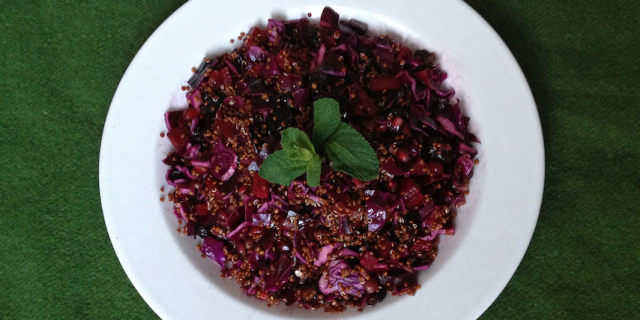 This salad focuses on the antioxidant power of the red/purple family of phytonutrients. The red/purple family contains anthocyanins, which have been found to protect against heart disease and even cancer. Red cabbage, pomegranates and cranberries are particularly rich in these anthocyanins. This salad is so much more than a tasty salad; it’s quite pretty impressive to know about the power behind the foods you are eating. Red cabbage is one of my favorite veggies of the moment. It’s versatile in its use and a true super food. Researchers have identified 36 anthocyanins in red cabbage alone making it truly one of the most nutritious vegetables around. Read more of the health benefits of red cabbage and anthocyanins here and here. Rinse quinoa well using a fine sieve. Cook for 10 minutes and allow to cool. You want to the quinoa to still have a bite (al dente). When the quinoa has cooled down add vinegar, olive oil and season with pepper and salt. Serve in a bowl with fresh mint on top.